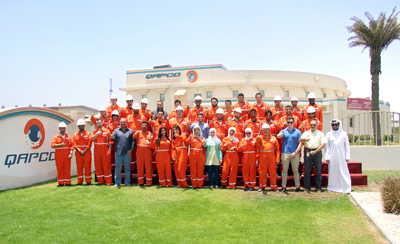 QATAR Petrochemical Company (Qapco) launched its much-anticipated 2014 summer internship programme and welcomed its 70 enthusiastic summer interns. The 70 highly motivated students from local and international universities joined the petrochemical company for an eight-week intensive training programme during which they will gain unparalleled exposure and significant industry knowledge. “Qapco strongly believes in nurturing today the talent of the future and places particular emphasis on the continuous coaching of its summer interns, as they will evolve alongside Qapco’s senior employees and professional education experts for several weeks,” its said. The programme began on June 24 with a three-day induction course designed to introduce the students to Qapco and included health and safety training, orientation of the plant and the issuing of personal protective equipment. It also included a workshop on time management to assist the students with their upcoming working schedule for the next two months. The programme is unique in Qatar as it also provides an array of innovative workshops delivered each Thursday to all students. The topics of these workshops include leadership skills, team building, and motivation as well as a workshop outlining the fundamentals of research and development that are essential to shape Qapco’s sustainable future.